I digress. 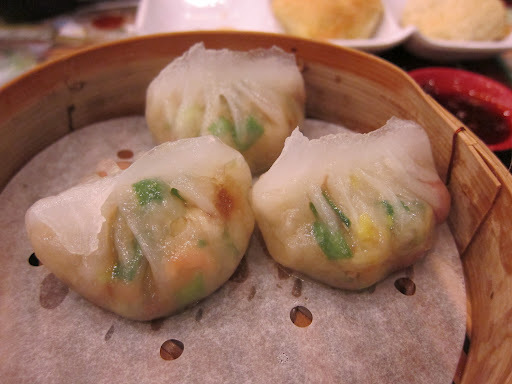 Dim sum in and of itself really deserves its own post. My point is that dim sum has always been a brunch or lunch time affair for me. When I ended my detox early, my friend JY was very excited. He had been raving about Tim Ho Wan(添好運點心專門店)- translated literally as ‘Add Good Luck’. It is Hong Kong’s cheapest 1 star Michelin restaurant – in fact, it’s most probably the cheapest Michelin-starred restaurant in the world. THE WORLD! “Let’s go TONIGHT!! !”, he says, in a pitch several octaves higher than his normal voice. 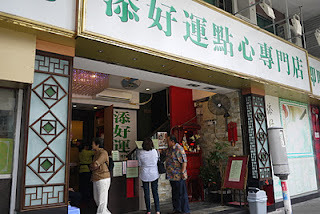 Opened by Mak Pui Gor, formerly of Lung King Heen (at Hong Kong’s Four Seasons Hotel), I have since learned that there are now three outlets, the newest in Central Station (no * yet), one in Sham Shui Po (1*), and the original restaurant in Mong Kok (1*). Queues for a table are renowned, with some waiting 2-3 hours for a seat in the Mong Kok branch. JY suggested that we go for dinner instead in Sham Shui Po , there wouldn’t be a wait if we went right before the kitchen closed at 10pm. The idea of dim sum for dinner seems just plain wrong, but who am I to say that things have to be so black and white? 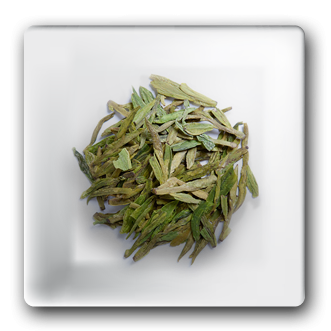 After 5 seconds of further ‘research’ on Wikipedia, I learned that rural farmers would traditionally go to tea houses after a hard day of ploughing, and weary travelers on the Silk Road went to yumcha when they needed a place to rest … hmmm. We had been hiking that afternoon, does that count? There are certainly commonalities to be found in that comparison! If the farmers did it, I’m not going to argue. The four of us intrepid adventurers MTRed to Prince Edward station and cabbed it from there (although it is walking distance). Thank goodness we did, because if it wasn’t for the taxi driver, we would have been walking in circles and missed our 10pm cut-off! The entrance is hardly conspicuous, and the sign is in Chinese only. Thankfully the restaurant was nearly empty and we were directed to our table immediately. The interior is more dai pai dong than deluxe, they charge for napkins, and if you want to drink anything other than tea, then go buy it at 7-11. I doubt I will ever go to another Michelin-starred restaurant where they give you a large bowl and a jug of hot tea to rinse your own plates and utensils prior to eating. The kitchen is so tiny, it’s really a wonder how the chefs are able to pump out basket after basket of the most delectable morsels. More meat and prawn, less gelatin and fat-filler, and some unexpected deviations from the norm make this a fabulous, filling, tasty, gimme-more meal, well worth a trek to the dark side. 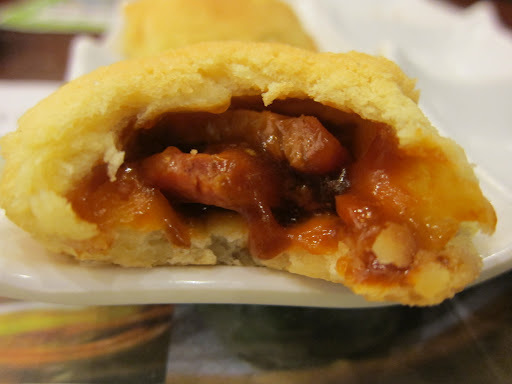 Double order of Baked BBQ Pork Bun (脆皮叉烧包 ) @ $15, thank you very much! 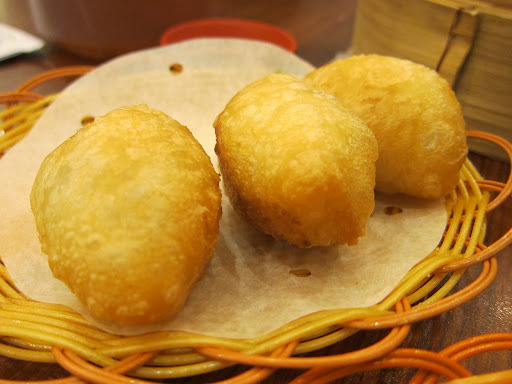 Crispy and sweet on the outside, succulent and saucy on the inside – these are one of Tim Ho Wan’s signature dishes. 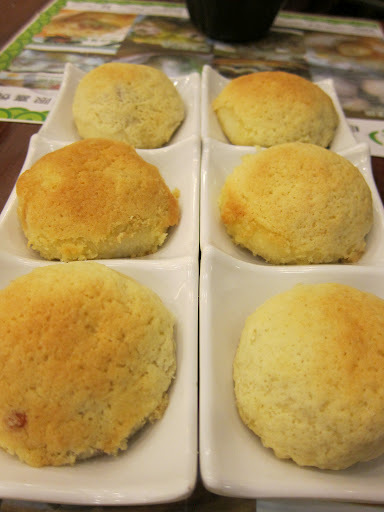 Although I must mention that my favorite baked buns are still at Victoria City Seafood restaurant at Sun Hung Kai Centre, these were pretty damn good – perhaps just a tad too sweet. Seeing that we arrived 10 minutes before the kitchen closed, I was impressed that they hadn’t run out of them! 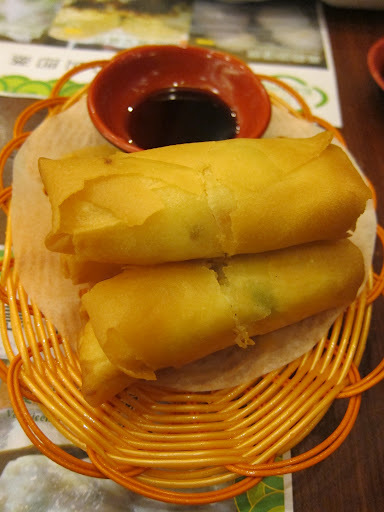 We just had to try the egg white spring rolls – a crispy light wrapper with a scrambled egg while filling. It sounded so wrong but tasted oh so right! 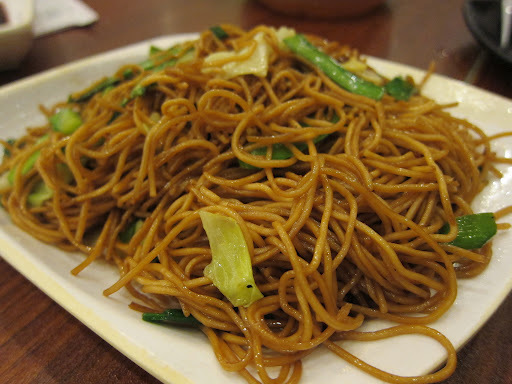 The fried noodles with soya sauce ($12) were ordered without thought, and as a filler. Nothing special to mention, but we ate it all nonetheless. 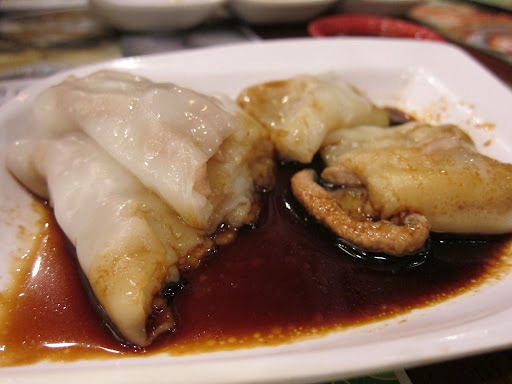 Cheung Fun is a dim sum favorite, look at those thin, translucent sheets of rice noodle! We went for the pig’s liver variation – liver is not my cup of tea so I was going to leave it for others to enjoy. JY, who loves a good challenge always, accused me of not being a genuine food blogger – and so I nibbled at it, and it was disgusting. Chewy, rubbery, with that distinguishing offal taste that I have never grown to like. Don’t be put off though, the others loved it! Hmmm I can’t remember what was inside these… Chives? Peanuts? Shrimp? I’d better go back to find out! The har gau were things of beauty – the wrappers thin and gorgeously pleated, the filing generous with large pieces of plump prawn. We should have ordered two baskets. JY was particularly complimentary about the pan-fried turnip cake. 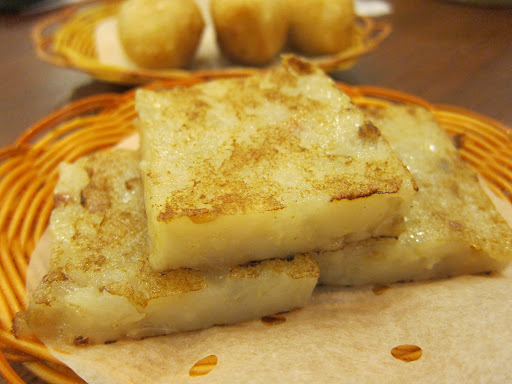 Although I would have preferred it more crispy on the outside, he mentioned that these cakes are purely radish (not turnip, despite the name) and ham, instead of just a sprinkling of these ingredients, which some restaurants inevitably do to keep costs down. 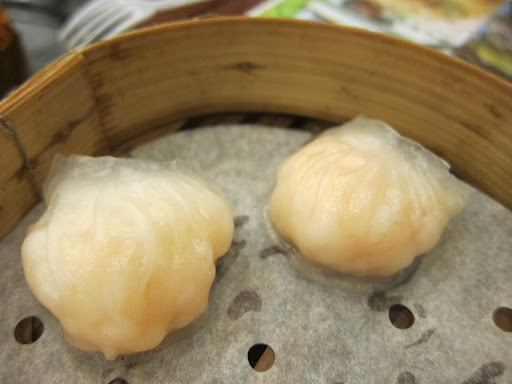 It demonstrates that Tim Ho Wan strives to offer high quality dim sum, even if it is at an affordable price. 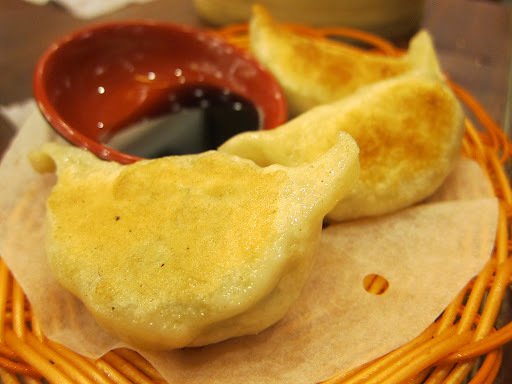 These deep fried glutinous dumplings filled with a hidden treasure of pork and mushrooms is to die for here – they are really not oily at all, the dumpling is perfectly chewy and sweet and sticky. Take my advice, order two portions and eat them hot. Hot fact: did you know they call these ‘football dumplings’ in Australia? How neat is that…I’ve never thought of their resemblance to balls, but there you have it. 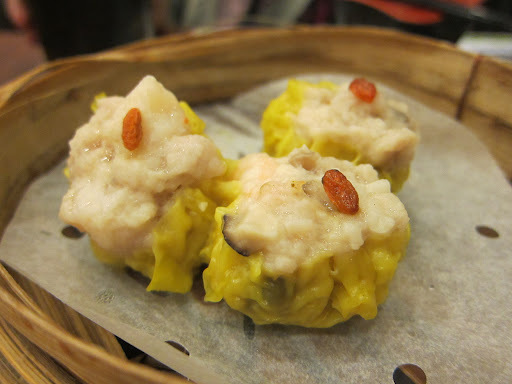 Usually chocabloc full of pork fat as a filler, I avoid ordering siu mai and stick to har gau. 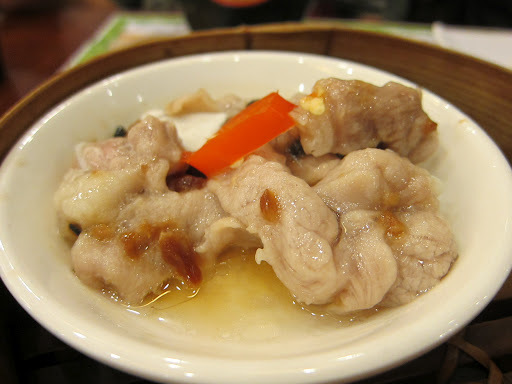 But this was different, lean chunks of pork holding the large pieces of prawn together – you really taste the difference. 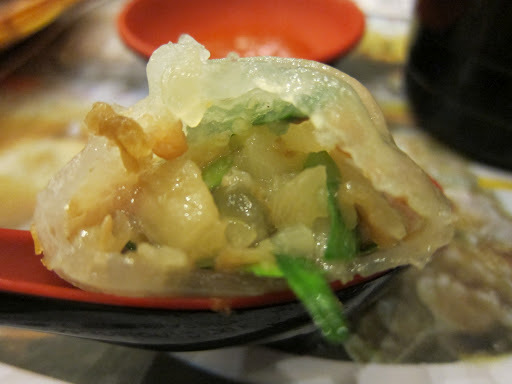 The surprise addition of water chestnuts gave these pork dumplings a satisfying crunch! Spare ribs in black bean sauce? Yes please! Even though at most establishments, I wonder if this particular piece of meat is thus named because of all the spare fat and not so much meat. This dish was particularly notable because they turned this trend on it’s head. Don’t you just LOVE malai gou?? 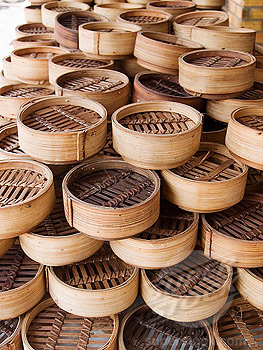 Not every dim sum establishment serves it, but when it’s on the menu it should never be missed. 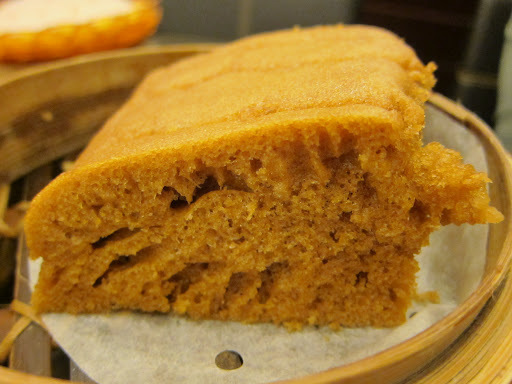 A very soft, steamed sponge cake usually flavoured with molasses, this is listed in the ‘steamed’ section of the menu, and not desserts. JY swears that there is a hint of maple syrup in this one. Next time, I will arrive in time to order the mains and desserts in two separate orders. Once the clock strikes 10:00pm, the chefs magically make for the exit like Cinderella, and I don’t blame them – it really makes me wonder how many buns and dumplings they make a day? 500? 1000? 2000? 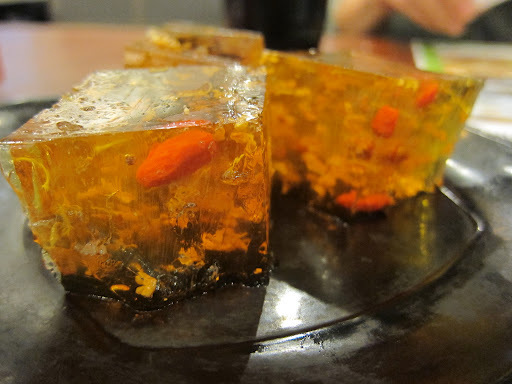 I’ve never eaten this before, and named “Tonic medlar and petal cake” on the menu, I hadn’t the slightest clue what it was – osmanthus petals suspended in a golden coloured jelly, accented with healthy goji berries, or wolfberries. Not too sweet and the perfect ending to the meal – osmanthus flowers are said to aid digestion and detoxification, while goji berries are packed with antioxidants and vitamin A, so this is a most guilt-free dessert! It’s not only cheap, it’s the cheapest dim sum you can get at any decent place in town, and its damn good. Another fact, if we ordered one of everything on the menu (30 dishes), then the total would come to only $498 – and that’s including the most expensive menu item – bobble boiled birds nest and egg white at $48 …at under $500 for the menu, we’ll forgive the typos. One more thing that has to be mentioned – the chili sauce. I rate Chinese restaurants according to the quality, taste, variety and overall WOW factor of their chili sauces. Many use generic sauces, but Tim Ho Wan appears to blend their own- it’s a beautiful union of Chiu Chow chili oil and XO chili sauce – salty and not too spicy, the dried shrimp creates layers of flavour while chili oil adds heat. The waitress brought over a whole bowlful after we clearly demonstrated (by eating it in one mouthful) that one tiny dish was not enough. I look forward to getting another group of friends together to visit the Mong Kok branch for comparison. I’ve found the online reviews of the Sham Shui Po restaurant (surprisingly) quite scathing, while the Mong Kok one is praised like a demi-god. Whether that is because it’s just all relative, I don’t know, but I found the SSP restaurant pretty darn good. Does that mean the MK restaurant is other-worldly? There’s only one way to find out. Looks super good Jen, I am going to give this one a try! Tonic medlar aye? Never seen that before! I'm not the biggest fan of dim sum but I have to admit this looks delicious!